Favourite Sweden missed its goal of gaining most gold medals in the long-distance competition as well as in the Sprint races. While Switzerland was most successful in the sprint competition Finland gained most triumphs now – seven on the whole. Behind them the nations Sweden (six gold medals), Germany, Norway and Great Britain (two gold medals each) follow. 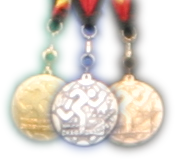 In the overall rankings Sweden won though, with ten gold medals and 38 of these precious metals overall. Finland ranges closely behind with nine gold medals and with some space Great Britain and Switzerland follow (six each). Switzerland loses three places after the great start in the sprint competition. Germany also loses one place and is now fifth in the overall standings – although it was third in the long-distance competition. Remarkable is not only the number of medals gained by Sweden but also the fact that the Scandinavian nation won exactly seven silver and seven bronze medals in both races.